Crash Bandicoot returned home last month and it's been rather bitter sweet for me. The moment the game begins, I start getting those nostalgic butterflies in my tummy. What I find really interesting, is that I still play the originals on my ps1, but the remaster strikes with me a different kind of awe. It could very well be the enhanced graphics, but the remaster just does something special for me. 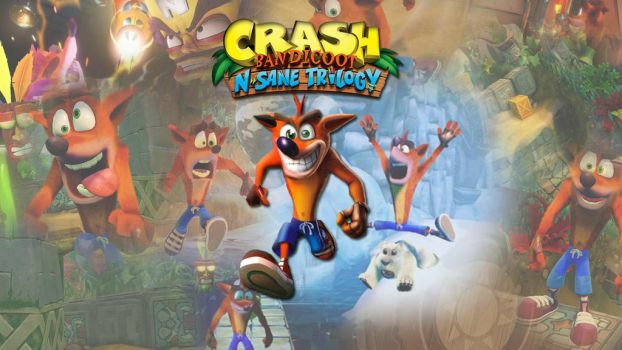 Welcoming new old fans alike, Crash Bandicoot N-Sane Trilogy offers something for everyone. With what I consider slight changes to the details and very enhanced visuals, if this game wasn’t already in existence years ago, it would still stack up in today's market as a brand new ip release. The fact that it was Junes top selling game in the UK, and had only one day to shoot to the top, not to mention it had a bigger sales than Horizon Zero Dawn, which admittedly took me by surprise. Early on, you will realize this game might not be as simple as you were expecting. I played the original right before release in order to brush up my skills and be sure I was ready. All my years of playing the crash titles did little to help me out. If you have been reading up on the trilogy or even playing yourself, you should notice that jumping and landing is slightly different. Thats where the bitter comes in for me. The number of lives lost while trying to land jumps perfectly are countless. I often feel like Crash just doesn’t jump far enough, but his depth is not the issue. As it turns out, it's his feet. Unlike the original, it appears that Crash has pill shaped feet, regardless of the visual outline. In other words, when you jump on or off a surface and are near the edge, you can easily slip off or miss your landing all together. Many times I stared at Crash’s feet and it always looked as though my feet has enough coverage to carry on gracefully, but after a few days out, the pill shaped foot explanation surfaced on the internet. For a few days there, it was driving me a little nutty, but knowing what I know now makes a big difference. The original Crash Bandicoot games are classics in my book and the N-Sane Trilogy hits the spot perfectly. You may tell yourself that it's near impossible to screw up a Crash remaster, but this could have gone very wrong. Hopefully, developers will follow in the same steps when remastering games in the future. With any luck, we might actually see brand new entry into the Crash universe, but time will tell. Crash Bandicoot’s N-sane trilogy gets a solid 9.75 out of 10, for the pill feet… Seriously though, if you’re wondering of it's worth buying, it absolutely is. Don’t get me wrong, I know not everyone enjoys Crash Bandicoot and a remaster won’t make the difference, but for those interested, I encourage you to give a shot.